It says,"Caucasians are superior to African Americans because we don't act like that." This is how white people riot in West Virginia. Why were they rioting? Because their football team WON! And a riot for the Kentucky basketball win! 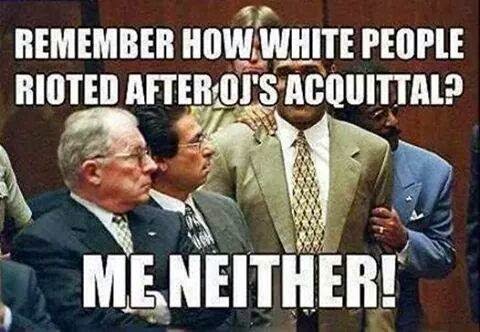 But, because White Americans kept their cool after the O.J. verdict, it only seems right (to the people who share the O.J. Simpson picture on Facebook) to point out their racial superiority at a time when the whole world is watching a U.S. city being burned to the ground -- not because of a Pumpkin Festival or a sports win, but on account of hundreds of years of hostility and tensions boiling over on a night when a militarized police force, hundreds strong, faced off and lobbed tear gas and other projectiles at non-violent protesters, while at the same time looters and rioters were burning the city down unencumbered. Last night I watched stores get looted and buildings burned without a law enforcement officer in sight; they were all standing off against the protesters. Thankfully I have sensible friends on Facebook, too, who are saddened by all of this, and are engaging in dialogue about how we can keep the kind of rioting that we've see in Ferguson (and everything that led up to it) from ever happening again. As I said on Facebook, I remember white people rioting in the 60's because they didn't like integration. It was horrible.